Christmas is my favourite time of year and now that the boys are getting older the magic of Christmas is really coming alive! 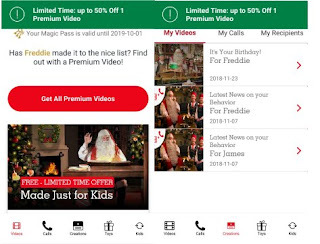 Ever since James first Christmas back in 2012 we have done the videos from Santa on the Portable North Pole (PNP) Website for him and then once Freddie came along we started doing them for him as well. When Portable North Pole asked if we would like to try out their Magic Pass for creating calls and videos for the boys we were thrilled! 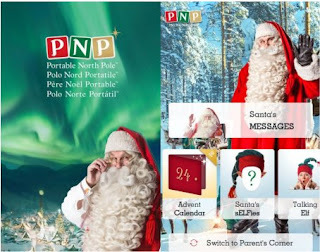 The first screen you see when you open up the app is a screen saying Portable North Pole in four different languages with a picture of santa. What I like is that it is the same Santa on the picture that is in the videos you can create! When the app opens it opens straight into a kids area where there is messages from Santa, a talking elf, an advent calendar and an elfie where you can turn yourself into an elf! The boys absolutely loved turning themselves and mummy into an elf! One of the options was to created a birthday message. For us having a November baby in Freddie we thought this would be brilliant. Especially as he is now turning 3 and he is starting to get into the magic of Santa.We played the birthday message for Freddie on his birthday and he absolutely loved it! I think it helped that we had actually been to see Santa the day before his birthday! Mummy has been having lots of fun creating messages for James and Freddie to watch over the next few weeks including a special one for Christmas Eve. The first call we tried was the behavior saying the boys were almost good. Freddie got very excited and was shouting Santa! Santa! The best thing that mummy has found is that to get into the parent area you need to have a pin code. This is a life saver as it means the boys can play on the kids area as much as they want but they can't get into the creating area so they can't see the videos and calls that mummy and daddy have got set up ready to go on Christmas eve! The Magic Pass costs £10.99 and is valid for a full year and the Lifetime Magic Pass is £19.99 and is valid for ten years! We are definitely going to keep on using the pass over the next year that it is valid and I have a feeling we will be investing in the ten year pass once this one expires!